We are awaiting a decision from the Ninth Circuit on the Trump administration’s drastic attempt to evade trial. Based on the strength of plaintiffs’ arguments and the oral arguments before the Ninth Circuit on December 11, we are optimistic that the three judge panel will soon rule in favor of the youth and lift the stay. As soon as we are back in the District Court, we will promptly ask the District Court to set a new trial date. Until then, we ask for your help in recognizing February 5th as a day these youth should have given opening arguments in Court. It is a day to recognize six months of the Trump administration doubling down on the violation of the fundamental rights of young people. He has opened up vast fossil fuel resources at the expense of our children and used rarely invoked legal tactics to avoid a fair and full trial. It is a day to stand up for no more delay. We will take to social media to show the federal government and the world that our youth plaintiffs would #RatherBeInCourt. 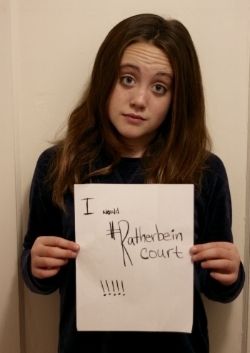 Join us by posting a photo of yourself holding a sign that reads “I would #RatherBeInCourt” on your social media channels with the hashtags #RatherBeInCourt and #youthvgov. And stay tuned also for a special video message from Our Children’s Trust on February 5th. Juliana v. US youth plaintiff Avery, 12. We are continuing to support youth-led legal initiatives around the globe for science-based, systemic government action to stabilize our climate. We will keep you informed of all legal developments in Juliana v. U.S. as they arise. This will be a monumental year for our climate recovery efforts in the U.S. and around the world and we could not do this work without your partnership. Thank you for all you have done to bring us to this important place. With your help in 2018, our youth will be heard.